Here are 4 free software to save desktop icon layout in Windows 10. You can save the position of desktop icons and then later restore desktop icon layout easily. Here are 4 ways to hide desktop icons in Windows 10. I have covered desktop context menu, Policy Editor, Registry, and free software to hide desktop icons. This tutorial explains how to disable changing desktop icons in Windows 10. You can use Group Policy and Registry to turn off chaning desktop icons. Learn to hide all desktop icons except system icons. Here is a free tool to easily hide all desktop icons except Recycle Bin, My Computer, etc. This tutorial explains how to set desktop icon spacing in Windows 10. Here are multiple methods to change horizontal and vertical spacing of desktop icons. This tutorial explains how to automatically hide desktop icons in Windows 10. You can set time (in seconds) to hide icons automatically and make them visible again using a click. This tutorial explains how to change desktop icons in Windows 10. You can change major system icons (This PC, Recycle Bin etc.) via personalization section. 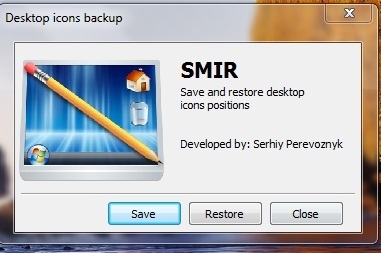 Smir is a free software that can backup and restore position of desktop icons. You can backup many different layouts, and restore any of them. ReIcon (Restore Desktop Icon Layouts) is free software to manage desktop icons by saving the desktop icon layout and restoring it whenever needed. Here is a list of 10 free software that you can use to arrange desktop icons on your desktop and make your desktop look attractive. Tiles is a free software that allows you to arrange desktop icons. It provides a stylish Windows 8 like sidebar where you can add desktop icons as tiles. DeskView is a free and lightweight tool that lets you arrange desktop icons in a list view. Try this out and embellish your desktop. ICU stands for (Icon Configuration Utility) which is a free utility software that lets you to save and restore desktop icons positions of your system. DesktopSaver is a free software to backup position of icons on desktop, and restore icon positions. Download DesktopSaver free.